The MCFC has an electrolyte which is composed of a mixture of carbonate salts.5 These are solid at room temperature but at the cell operating temperature of 650°C, they have become liquid. Work on high-temperature MCFCs began during the 1950s. The US army tested cells during the 1960s and in the 1970s the US Department of Energy began to support research. Japanese companies also picked up the technology. By the end of the 1990s pilot units of up to 250 kW had been tested, mainly in the USA. Development accelerated in the early years of the twenty-first century and in 2003 there were more new MCFC fuel cell installations for stationary power applications than any other technology.6 Most, however, are still pilot or demonstration units. If these prove durable then commercial units should become available before 2010.
carbonate ions (CO2-). Hydrogen is fed to the cell anode where it reacts with these carbonate ions, producing water, carbon dioxide and electrons. As a result of this reaction a part of the electrolyte is consumed and so must be replaced. This takes place at the cathode. 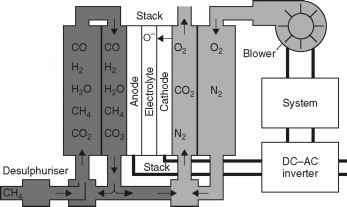 The carbon dioxide generated at the anode is carried around to the cell cathode. Here it is mixed with air. Oxygen in the air reacts with the carbon dioxide at the electrode, producing more carbonate ions which re-enter the electrolyte. In this way the composition of the electrolyte is maintained and the overall cell reaction remains that of hydrogen and oxygen reacting to produce water. As a consequence of the elevated temperature of operation, the MCFC does not require a platinum catalyst so electrodes can be made of nickel. The electrolyte is contained in a porous refractory tile and the nickel electrodes are applied to its surface. A further advantage of the high temperature is to render the cell insensitive to carbon monoxide. In fact any carbon monoxide present will also react at the cell cathode, behaving as additional fuel. The cell operating temperature is so high that the natural gas reformer can be built into the fuel cell itself, simplifying the system design. However the use of a high-temperature liquid electrolyte presents some significant technical challenges. Overcoming these successfully will be the key to the success of this type of fuel cell. MCFC fuel cell may be theoretically capable of between 75% and 80% overall efficiency. The largest MCFC power plant to be built was a 2-MW demonstration unit in Santa Clara, California. Although this plant did not achieve its design goals it provided a test bed for MCFC technology and provided the US Department of Energy with the confidence to support the development of commercial units. This was carried out in conjunction with a company called Fuel Cell Energy (FCE) which is developing 300 kW, 1.5 and 3MW commercial units. FCE technology is also being used by the German company MTU Freidrichshafen GmbH as the basis for a 250-kW packaged fuel cell power plant called a Hot Module. Meanwhile FCE is working with the US Department of Energy to develop a 250-kW fuel cell unit with an integrated gas turbine. This is expected to form the basis for a 40 MW power plant with an efficiency approaching 75%. Japanese and Italian companies are also developing MCFC modules. 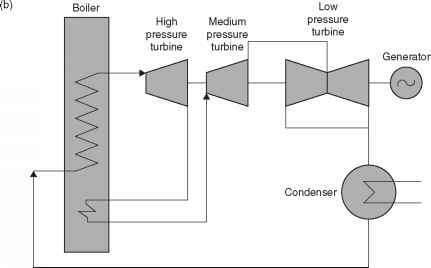 The MCFC technology is perhaps the most complex of all fuel cell power plant technologies under development. The high-temperature operation combined with the use of a liquid electrolyte makes the technology expensive at a small scale and a unit size of 200-250 kW appears the minimum. If costs can be brought down, this technology offers the highest efficiency of all fuel cells, perhaps the highest achievable by any fuel to electricity conversion technology.